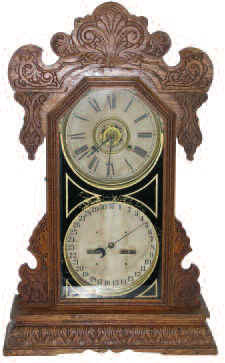 Waterbury Clock Co. shelf double dial calendar clock "Oswego", ca. 1900. Oak case with original finish, 28 inches high, two partial labels on back, one inside. Original glass needs to have some of the black backing touched up, the gold trim is in good condition. Both dials are original with minor water stains; month paper roll is loose and needs to be glued to brass roll. 8-day time and strike movement is running but should be serviced. Overall this is an original clock except for the small brass door latch. Reference Millers Calendar Clocks, page 96. Figure No. 287.